Well it’s long overdue that I review a game so I figured I’d get down to it. Anyone who played the original Assassin’s Creed will know the very blatant flaws that Ubisoft presented us with. On one hand you had a stunning game, especially for 2007, that beautifully recreated the holy land of the Middle Ages, along with the irritating beggars and templars; albeit be it slightly condensed, with Damascus being a short country stroll from Acre – but we could forgive that. However, on the other hand, and what many found it hard to forgive, was the hideously repetitive and unoriginal gameplay. It felt as though they’d finished the graphics and gameplay mechanics but got a little bored and fancied a cup of tea and a biscuit instead of wasting anytime on combat or content. Big mistake. Because of this, and because of the hype that had surrounded it, prior to its release, it received a pretty bad wrap from a large percentage of its potential community. However Ubisoft have admirably, taken the feedback. 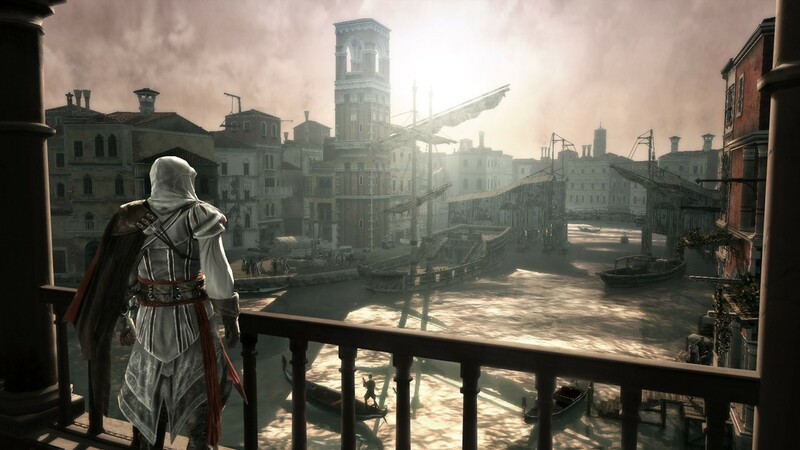 In ACII you play as Ezio Auditore da Firenze, an Italian, born to a wealthy family in Florence, and yes, you are literally born in the game, gooey fluids and all. From there on the hilarious Italian accents roll forth, but it comes off as charming and a little quirky to anyone who understands it’s a game and not BBC costume drama. Within the first couple of minutes the narrative is already clearly more comprehensive, coherent and interesting than AC1. You start developing connections with your family and actually care for them – even your “Its me, MARIO!” uncle. This time round our assassin doesn't have an inexplicable aversion to water. The story this time round is infinitely more engrossing, but builds on the plans that AC1 set out, and while some parts feel a little far-fetched, given the story, it generally works pretty well and many reviewers report that they played the last quarter solely for the narrative, not because of bad gameplay, but rather because of the fantastic story. Along with the painstakingly recreated historical architecture, the game attempts to throw a few historical personalities in the mix. But it makes no claims that it’s a true representation, and simply entwines them in the story for fun, the most noteworthy being Leonardo Da Vinci who acts your Q-esque gadget man and sidekick, and I personally very much enjoyed the cute and somewhat awkward bromance that occurs between Ezio and the renaissance inventor! One of the most marked improvements is the variation in gameplay and missions. Each main task has its own unique twist and element in the story, from use of Da Vinci’s (apparently workable) flying machine to a spaghetti western horse and cart chase. There’s even some sections underground that feel very Prince of Persia-ish, but its done in such a way, and only for a short section, that it feels like a little tribute to the earlier free-running platformer games, while adding yet more variety. The length of the story is not overly generous but certainly isn’t cut short like the recent Modern Warfare 2 and there’s plenty of side quests and places to explore for extended gameplay. This blockbuster actually manages to reconcile all its ideas exceedingly well and everything is tied in with the narrative very well, even the random collectibles spread over the cities and countryside which is a welcome improvement on the glowy flags in AC1, whose inexplicable existence in a game so set on being realistic on many levels, irritated me a great deal. Ubisoft, in their effort to add heaps more content into this sequel, which is of course not a bad thing, instituted Ezio’s villa and town, and have tried to travel down the RPG route, however it hasn’t worked spectacularly, because really, they got tired out and gave up halfway along that route: To do up the villa and town, you must spend money and invest in it; this in turn either raises the villa’s income, or lowers the cost of weapons, armour and medicine in the shops. It doesn’t take a genius to workout that after a while, with no upkeep costs and no threats, that you’ve got the perfect investment – no pyramid scheme here. Except, you end up rolling in money with diddley-squat to spend it on, as the consumables, such as medicine and knives, cost pocket change. Additionally, in this villa of yours, there’s no choice, and no decision, its just invest in everything once you have the money, which you can simply wait for, piling up every 20 minutes in your chest. And thus this feature seems fairly hollow when you look at it. Infact within the game as a whole there’s not much choice at all, which is not necessarily a bad thing, but it is when there is the pretence. For example, you can customize the colour of your robes, but the choice rangers all the way from grey with mustard spilt on it, to grey with ink spilt on it. Having said all this, the town, villa and clothing features are all fairly well presented features, and one has to take the attitude that its better they’re there than not, although they don’t reach their full potential. One area where there is a fair amount of choice and personalisation is weaponry; there’s are quite a wide variety of swords and daggers, and you can use certain other weapons by disarming guards. Nabbing a pike, then proceeding to impale your foes and then scraping their limp body off it again, entrails and all, I assure you, is quite delightful. The game features a number of stunning Italian locations, but not Rome in its entirety, unfortunately. Mutilations aside, controls can be a little ropey and unforgiving especially with the targeting system, but for a game that tries to accomplish so much, it is understandable. Mirror’s Edge did a far superior job in terms of free running but its still fun to roam the rooftops like a maniac and throw yourself into piles of hay with safety mats hidden underneath. Combat feels fairly similar to the original, just with many more differing ways to humiliatingly slaughter guards, arguably just doing their job – but this time round it feels a lot more fluid. The countryside has been opened up so that all the cities aren’t connected by a convenient series of gorges through the rocks, and should you want to forego the scenic route, there’s a quick travel system that was much needed. Assassin’s Creed 2 is the perfect example of a sequel that’s improved upon the original according to customer feedback. Every aspect of the original game is in there, except with more variety and fluidity. Not only this, but it also offers up a great story and fascinating historical links and information. Being a great advocate of both interactive story telling and games as art, this certainly ticks many of the boxes, and what’s more arty than the architecture and paintings from the Italian Renaissance? After Modern Warfare 2, this is a must buy – there’s a great deal I’ve missed out on account of spoilers, as this is definitely a game which your going to be and going to want to be surprised at, at every turn, whether it’s the final twist or simply your mother beautifully saying the words “Besides Vaginas!” in that lovely accent.